A smart businessman once told me, “Don’t lie to people you trust, and don’t trust people who lie.” It was sage advice. Unfortunately, I was young and inexperienced and failed to see he was someone I couldn’t trust in that workplace and so his advice, while true, was folly for me and I missed his warning shot. We’re hearing a lot these days about how important trust is to the overall success of a team when leaders are choosing key business partners. Trust is a precious jewel, especially in the workplace. It is earned or threatened in every experience and as a leader, having people you can trust surrounding you allows you to focus on doing your job, and not focusing on the threats that surround your success. 1. Quite simply, truth is safe inside the walls of a relationship built on trust. Trust sets the groundwork for communication that is genuine and real. That means, if you want people to tell you what’s really going on (and not just what you want to hear) you’ve got to surround yourself with people you trust implicitly. In turn, they have to know that you won’t reject loyalty and honesty. Let them know you appreciate the honest voice in a sea of fake affirmations. 2. You can ask the stupid question to people you trust, knowing the exchange is for the purpose of learning and improving the strategies. Trusted advisors make you smarter if you let them. They cultivate an environment of exploring all the options for next step. You don’t have to worry that the person will walk away laughing at you and calling you a dummy if you say you don’t know something. Iron sharpens iron, and leaders can only truly move to the next level of expertise when they allow themselves to be made better by smart people they can trust. Likewise, you can bounce new ideas off these trusted individuals, and they’ll tell you the truth about how the idea might work, or how it might be perceived. It’s a hard reality but showing vulnerability to someone you can’t trust can be your final blow in the workplace. 3. Someone else is always vying for your job. We could pretend this isn’t true, but we’d all be lying! Leadership is hard, whether you’re leading a team of two, or a team of thousands. 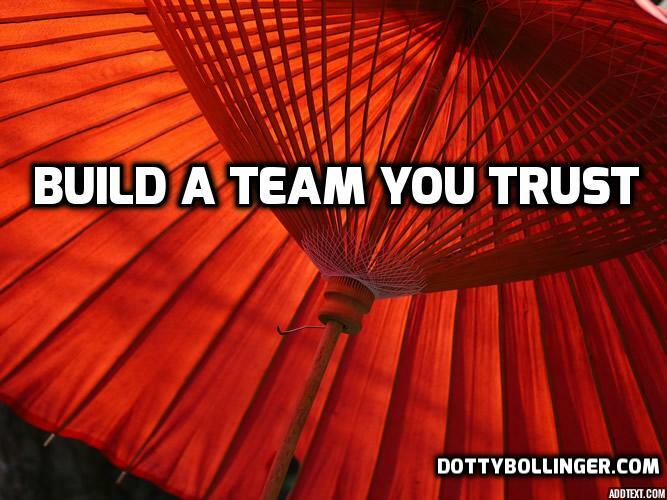 Surrounding yourself with people you trust makes the entire team stronger. Think of trusted advisors as “watchmen on the wall” who are on the lookout for those who would destroy what the team is trying to build. For every trusted person you have on your team, recognize there are a few who would like to see you fail. When it’s up to you, surround yourself with people who have earned your trust, and whose trust you’ve earned. Protect those relationships, deal with honesty and integrity, and listen. These are the people who will make you smarter, more effective, and more likely to be successful.